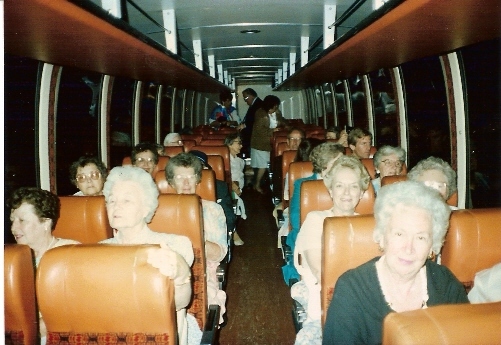 Monday morning after the Shirley Convention, a group of 30 Shirleys boarded a coach and went to Norfolk Virginia airport where we flew to Boston Massachusetts. 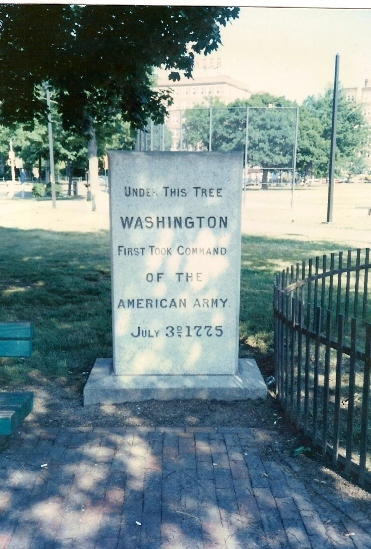 We boarded another coach and drove around Boston site seeing. One of the places we visited was the Kings Chapel where Governor William Shirley is buried. The Chapel is closed on Mondays but I had made arrangements with the Curator to come and open the Chapel. He graciously gave us a tour and spoke to us about the Chapel's history. From here we went to the hotel where we checked in, changed and left again for the Shirley-Eustice House, former home of Governor Shirley. We were given an escorted tour of the house before dinner was served. The evening was quite delightful with good company and musical entertainment. 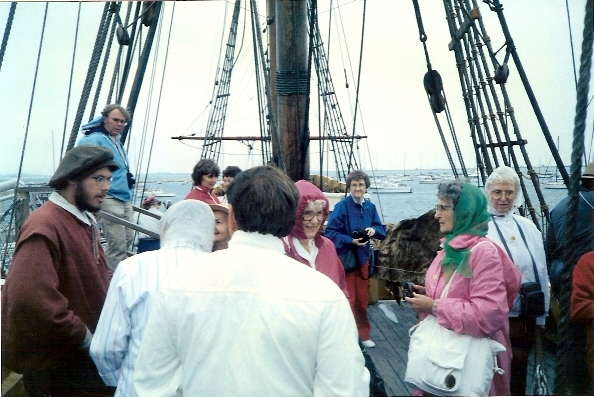 Some Shirleys came to meet our group and dined with us as did the Curator of Plimouth (Plymouth) Colony and his wife. Those on the board of the Shirley-Eustice Foundation were gracious hosts. We enjoyed meeting them and learning about the refurbishing of the Shirley Mansion. 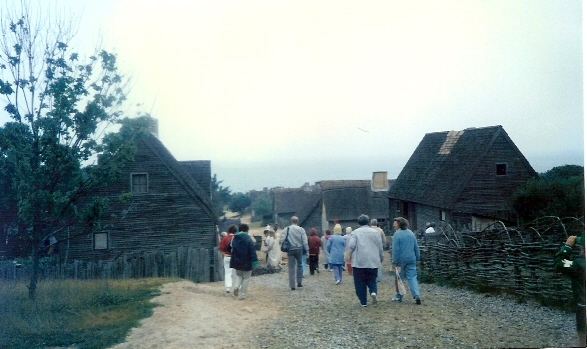 Tuesday morning we visited Plimouth Colony and the Mayflower, both are replicas of the originals. 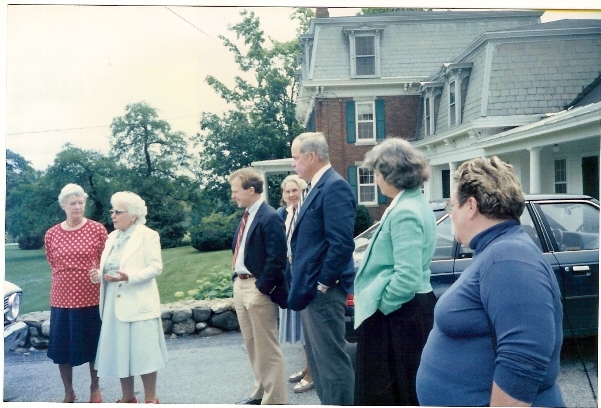 In the afternoon we drove to New Hampshire to the farm at Shirley Hill, home for six generations of Shirleys. This branch of Shirleys is James #25 who came from Ireland in 1730 and settled in the Chester NH area. We were greeted by Mary Shirley who lives there. Her husband, Larry, passed away last year. 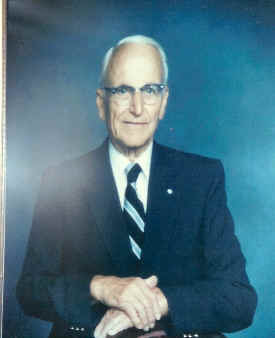 Her nephew and his wife, Dr. Robert and Althea Shirley, came up from Boston to be with us as well as having been at Governor Shirleys with us for dinner the night before. A few other Shirleys came to meet us here. We had a great time visiting, touring the farm and visiting the cemetery out in the back. We returned to Boston that evening and dined at Pier 4 on Boston Harbor. What a view! Wednesday morning we checked out of the hotel, loaded onto the bus and we were off to New York. That evening we we attended a Broadway play, THE NERD. After the play, we went to the State Empire Building and went to the top. It was about 10:30pm and so quiet and peaceful. What a view from the top! Thursday morning we took a Ferry to the Statue of Liberty, and in the afternoon we left for Washington's Crossing on the Delaware. We had lunch in a restaurant right across from this historical place. By evening we arrived in Philadelphia Pennsylvania and checked into the hotel. Friday we took a tour of Philadelphia. We visited the Liberty Bell, and other places of colonial interests. For dinner, I had booked a cruise for the group on the Delaware River. Saturday morning we departed for Gettysburg Pennsylvania and a tour of the cemetery. 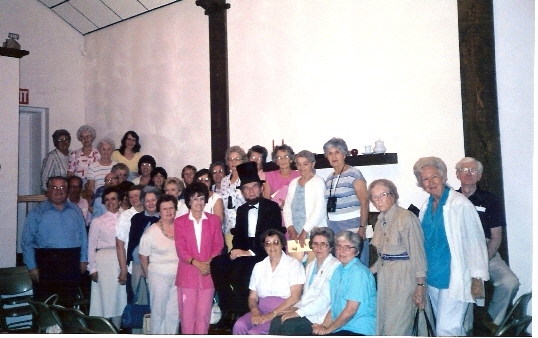 We visited Mr. Lincoln where he gave a performance and later had a photo session with him. He was very good! You would have thought he was really President Lincoln. That evening we dined at a place called COZY in Thurmont, Maryland. What a dining experience! We moaned and groaned because we over ate. We drove on to Manassas Virginia where we checked into the hotel. Sunday morning we were up and moving. We attended the services at Broad Run Baptist Church in Prince William County VA.. 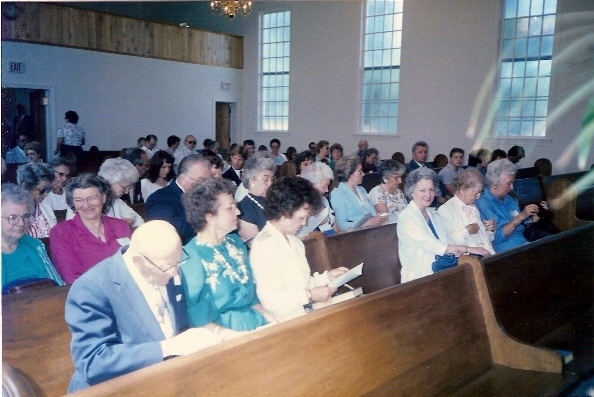 The pastor made mention of us and that some of the Shirley ancestors had attended the early church in the 1700's. After service, we went to a restaurant for lunch and more Shirleys joined us there. They came from Maryland, Virginia and Tennessee. I had arranged for a local researcher to locate the properties of John and Thomas Shirley. She spoke to us about her research on our behalf and then we boarded the bus for a drive over to the property they had owned about 1770. Late in the afternoon we returned to the hotel and walked around the hotel, and walked around the hotel, and walked around the hotel.... yes, we walked around the hotel. We needed some exercise and there was no place to walk except around and around the hotel. Monday we drove to Harpers Ferry and had lunch on the hill, did the tour, followed by a drive thru the Shenandoah Valley. That evening we stopped at Front Royal and had a steak dinner. Those steaks were good sized... 14 ounces. 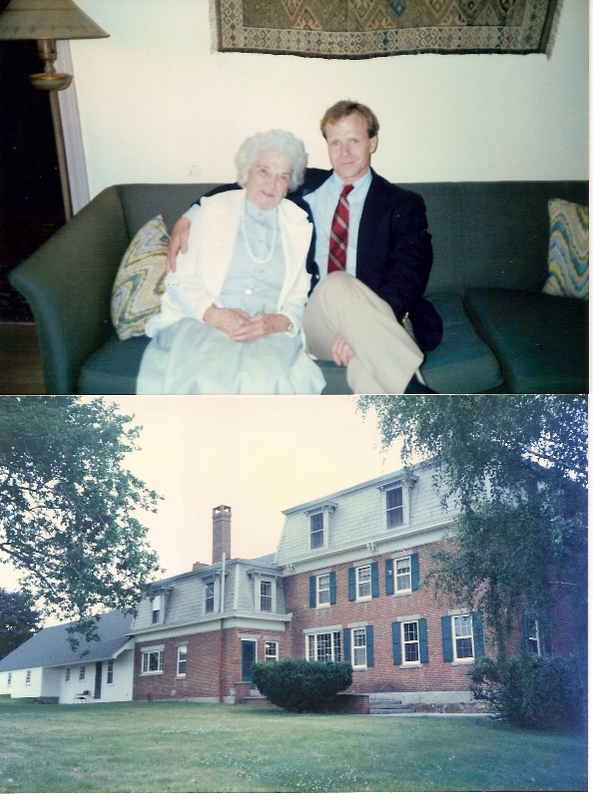 I had made arrangements for Julia Creamer to join us there to share some documents and a photo she had shown me on a previous visit to her home. The document has been in her family for generations. The document is an original and was signed by George Washington when he surveyed property for her ancestor, Walter Shirley, branch #19. 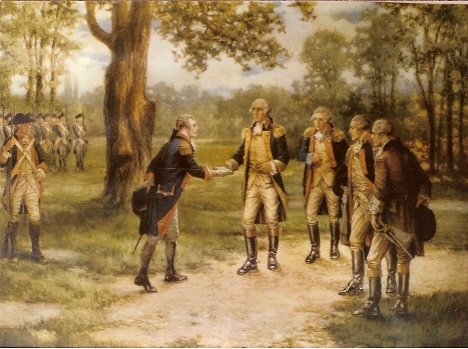 She also had a portrait of Governor William Shirley commissioning George Washington as Commander of the American Army. Tuesday we checked out of the hotel and drove over to Mt. Vernon, home of George Washington. 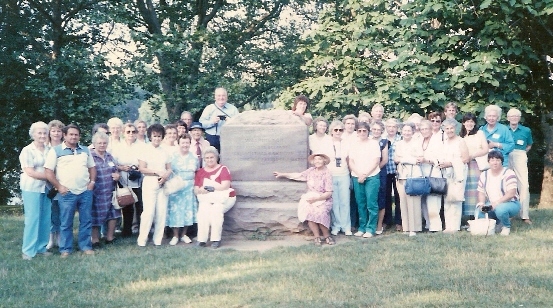 We did a group tour and from there we drove to Northumberland County Virginia to visit St. Stephens Parish. 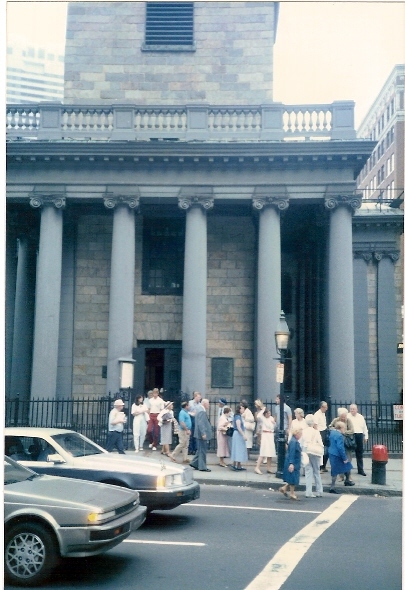 This is another location where the early Shirleys were in the 1600's. Two ladies who do research for the area and have done research for us, spoke to us for awhile about the beginning of the area and the Shirleys. We were asked if we would go a short distance with them and have a group photo taken in front of the now abandoned Shirley Hotel for their newspaper. By evening we had returned to Williamsburg Virginia where we started. The next morning we said our tearful good byes as we all went our separate ways. To say we had a great trip is an understatement.